The rest of the album follows suit. Listen to the first sustained pitch Watts deftly inserts into the quartal and clusteral sonorities Grew's laying down as he builds his "Tunnels." Listen to the snapped B-flat with which Grew echoes Watt's second pitch, an absolute masterstroke of a response delivered as the sudden spark only intuition can ignite. Move to the gravitas of Watts' minor soliloquy opening "They're All Home," with its respectful nods toward silence, and feel the full impact of Grew's subtle and complete command of the piano's insides. The disc is a wondrous mixture of topic and texture, of technique and plain old soul. 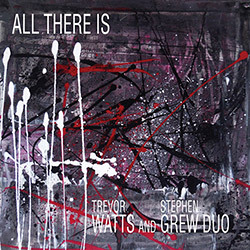 This is improvised music that speaks as much to the heart as to the head, and it demonstrates the fruitful relationship fostered by this intergenerational duo.